The U.S. Virgin Islands (USVI) are a group of about ninety exotic Eastern Caribbean keys that lay to the east of the Dominican Republic and Puerto Rico. The small territory consists of three principal islands, St. Thomas, St. John, and St. Croix – each having its unique charm. 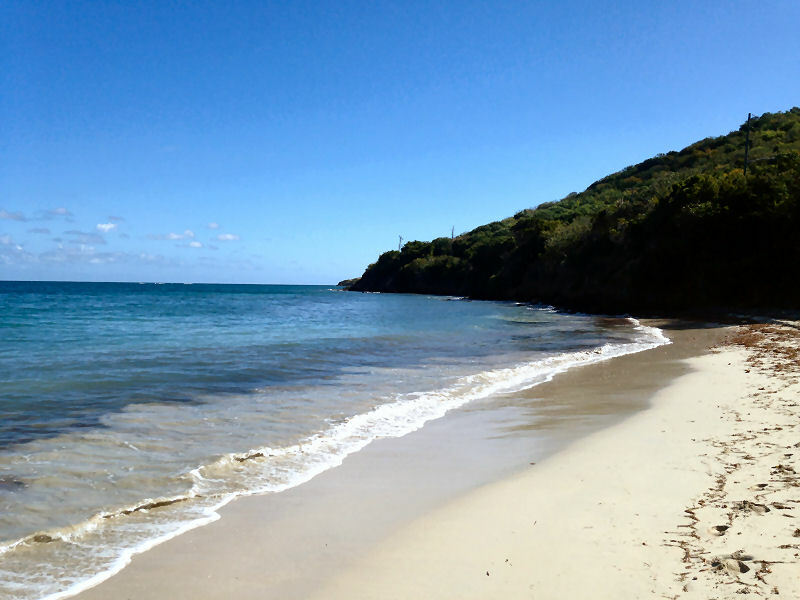 All of the Virgin Islands beaches are worth exploring! St. Thomas is the most popular cruise port in the Caribbean, and is best known for its luxury (think yachts docked in the harbor and fancy boutique shops) and famous Lindquist Beach, while St. John is best suited for nature lovers and honeymooners, and has over seven thousand acres of parkland to explore with stellar beaches (most of the island is actually an official Virgin Islands national park) to lounge out on. The happenin’ island of St.Croix is situated in the Southern Caribbean, and has sugar plantations and rum distilleries, with plenty of diving spots and botanical attractions, in addition to antiquated food and music that lives on. The USVI are just a hop, skip, and a jump from the continental United States, so these islands are practically in your backyard if you live in the States. Picture radiant blue waters that caress mile-long sandy stretches of sand to lush mountain valleys with fascinating flora and fauna. Swaying palms, white sand, postcard-perfect vistas, and pungent smells of spicy seafood that will awaken your senses are just some features that may entice you to this tropical getaway. From touring forts and museums from the seventeenth and eighteenth centuries, to deciding amongst the many options of places to stay such as bed and breakfasts, upscale villas, and campgrounds for those of you that want to spend some time in nature, there is no shortage of fun activities to be had here. The beaches of these beautiful islands are home to a vast array of underwater species and lively corals that are ideal for swimming, snorkeling, diving, or taking a boat out on the water for the day. Or, you might choose to windsurf, jet ski, sea fish, or kayak to pass the time. Save Sandy Point, all beaches in the archipelago can be visited year round- so, feel free to plan your trip any month of the year. The U.S. Virgin Islands are home to just over one hundred thousand people, most of whom are English speaking, and serves as a vacation spot to over two and a half million visitors each year. You can choose to occupy your vacation time by visiting just one or all of the islands. Any way in which you elect to enjoy these refreshing waters will surely gratify you. 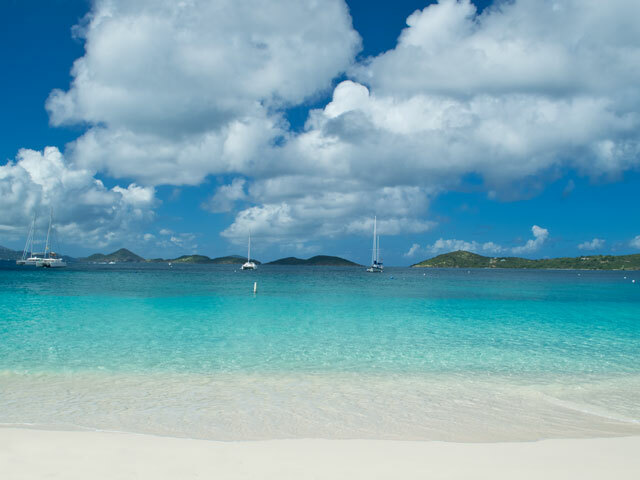 So what are the best beaches in the US Virgin Islands? One of the most beautiful beaches in the Caribbean, the heart-shaped Magens Bay beach is one that provides a family experience with calm, transparent waters and beautiful white sand. If you’re one that likes a ‘shady’ beach experience, this Caribbean beach is lined with palm trees that will give you just the right amount of shade! You’ll see many active people on this seashore participating in activities such as powerwalking, running, mothers pushing their strollers, children riding their bicycles, and people floating in the ocean. There can be small to large gatherings of people on this beach. If you want the bank to yourself, do visit during the early morning hours. There are a few hotels nearby that make this bay resort like in feel, but it’s a popular beach, so it can’t be helped! If you’d like to rent gear for a certain water activity like kayaking or paddle boarding, the Yak Shak on the North side of the beach rents out gear as well as instructs you on how to use it if you need guidance. There is a bar and eating joint at the concession at the bay resort entrance, where you can also buy souvenirs and get your hair braided if you so desire. Note that lifeguards are on duty every day. The entrance is free for kids under twelve years old, and for the elderly and handicapped. For everyone else, it’s usually about a five dollar entrance fee to access Magens Bay beach. Lastly, there is lots of parking. 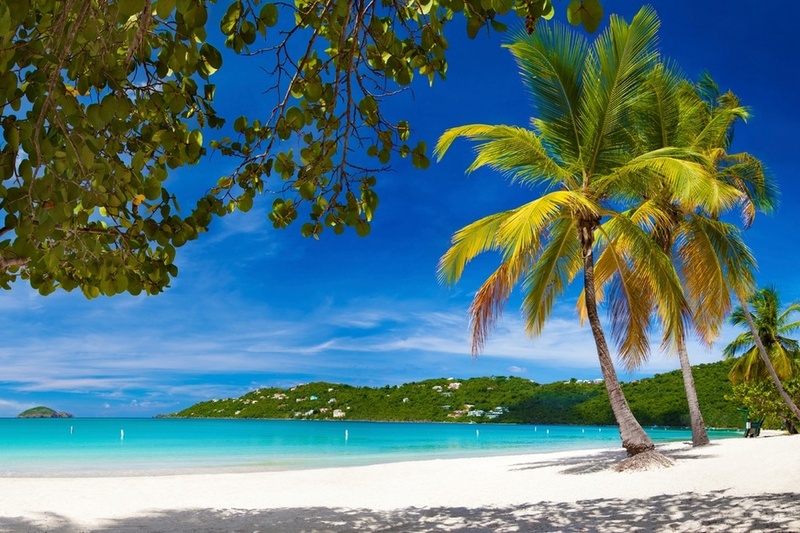 Cinnamon Bay is the longest beach on St. John and this rose-colored sandy beach is lined with gorgeous coconut palms bordering crystalline waters. Amenities include a snack bar, a souvenir shop, and a shop where you can rent snorkel gear if you want to venture off and explore the small island off the coastline. This best and seemingly endless beach has a concession stand for item rental such as paddleboarding, windsurfing, kiteboarding, and features showers for rinsing all the sand off. 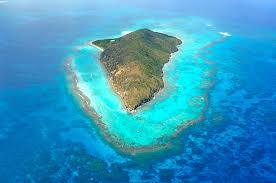 If you love snorkeling, a prime spot is along the small island just offshore, and along the Eastern part of the inlet. You might just see some eye-catching coral, colorful Caribbean fish, an exotic turtle or a stingray. For those of you that love to fall asleep to the sound of the ocean waves, you might enjoy the campground on the beach. If you hike a little bit along the shoreline toward Peters Bay, you’ll eventually hit an area where you’ll see the remains of a wrecked aircraft from years ago, which might be neat for children to see. As a result of a hurricane, this park is temporarily closed and is set to reopen sometime in 2019. Also, there are restrooms on-site. Situated within the Virgin Islands National Park, Honeymoon Beach is one of the best beaches in the area, with clear, peacock blue waters that wash up against illuminated patches of sun-kissed sand. You might choose to individually rent beach equipment such as stand up paddleboards, floaties, beach lounge chairs, kayaks or masks and fins at the watersports shack. Or you can choose to rent a bundle of equipment for one fixed price. There’s an All Day Honeymoon Beach Pass that is available for purchase, which includes access to a plethora of items such as snorkel and kayak gear, a beach chair, a locker room, and restrooms, in addition to other benefits. If you choose to make reservations online, you can receive a small discount. When you get hungry, Canella Beach Hut serves paninis, snacks, homemade gelato for dessert, and beverages such as piña coladas and ice cold beer to cool you off. If you’ve been dying for a wonderful snorkeling opportunity, explore the Western part of the beach’s patch reef, where much colorful fish, bright corals, turtles, and stingrays reside. 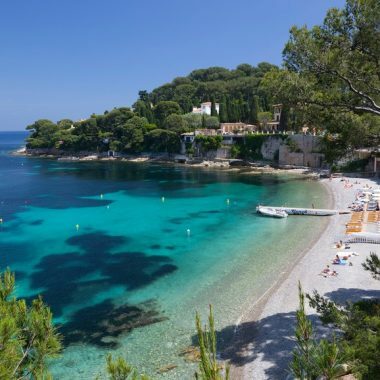 Beneath the tree canopies, you’ll see hammocks and picnic tables galore on this coastline. From Lind Point trail, you can access Honeymoon Beach – you can see the Virgin Islands National Parks trail page online for further information. 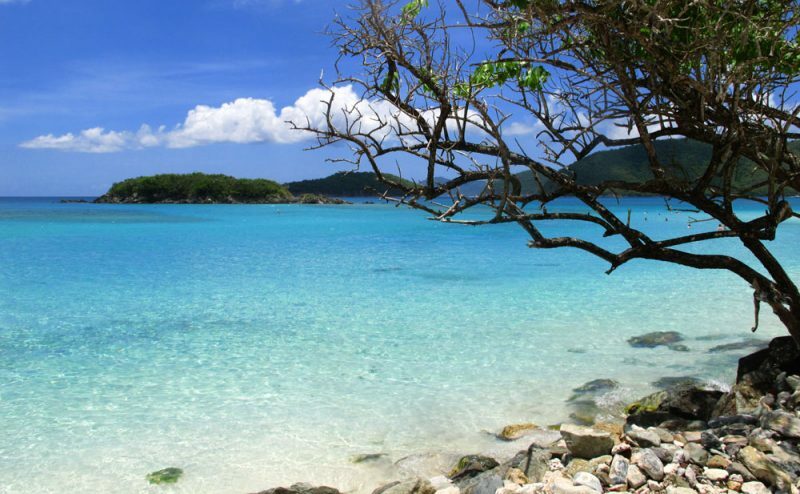 As you can imagine, it’s one of the top Virgin Islands beaches. Known for being one of the most photographed beaches in the USVI, Trunk Bay is one of the longest beaches in the region with a long shoreline boasting over a quarter of a mile of soft white sand. You will not find an airport on St. John, so expect to travel by boat (which is how ninety-nine percent of the visitors arrive). Trunk Bay is the only beach on St. John that requires you to pay an entry fee, but it might just be worth those few extra dollars- sometimes splurging can be necessary on vacation. If you don’t feel like the entrance fee, Caneel Bay is just around the corner. It’s nice but it’s not Trunk Bay! There is even a two hundred and twenty-five-yard long self-guided snorkeling path you can follow that’s underwater (with exhibit placards that feature details and pertinent information about the marine life), if you’re feelin’ adventurous! Remember to bring your waterproof camera if you have one for some great pictures. On the Western side of the small island that lays about thirty yards off the beach is where you’ll find ideal snorkeling spots which are more protected from the wind and are fairly shallow. Aquatic life that you will surely see down under includes unique fish and coral that pepper the ocean floor. For those of you that are looking for some seclusion, you may want to stay on the Western part of the beach, because if you walk down far enough- you’ll find another smaller beach, and chances are you’ll have it all to yourself! Just keep in mind that sometimes the waves around the outer edge of the cay can become quite strong, according to the weather and the tides, so be alert. From Cruz Bay, you can take Route Twenty for about two and a half miles, and then drive down the hill for beach parking at Trunk Bay. Reliable taxis are pretty easy to find if you don’t feel like driving around St. John. As far as places to stay are concerned, there are many places to lay your head for the night that are a quick ten minutes away. There are also over three hundred vacation rentals available if you want a more private abode. Don’t expect to find many all-inclusive resorts here- actually, there’s not even one! The fee to access Trunk Bay is five dollars per person, and more often than not, a lifeguard will be on duty. Buck Island, located in the Northeastern Caribbean, is a sight to see. Two-thirds of this one hundred and seventy-six-acre island is encompassed by a barrier reef, where you can easily spot a variety of marine lifeforms such as elkhorn coral and green turtles in the cerulean blue waters, or animals such as brown pelicans on land. Buck Island is part of an area called Buck Island Reef National Monument that totals about four and a half thousand acres, all of which is underwater-it’s a hot spot for snorkelers! The Eastern tip of the reef is where the underwater snorkeling trail starts, and you’ll see plaques that have been placed at the sea floor describing the lifeforms found in the reef, for those of you that are curious about the flora and fauna descriptions. 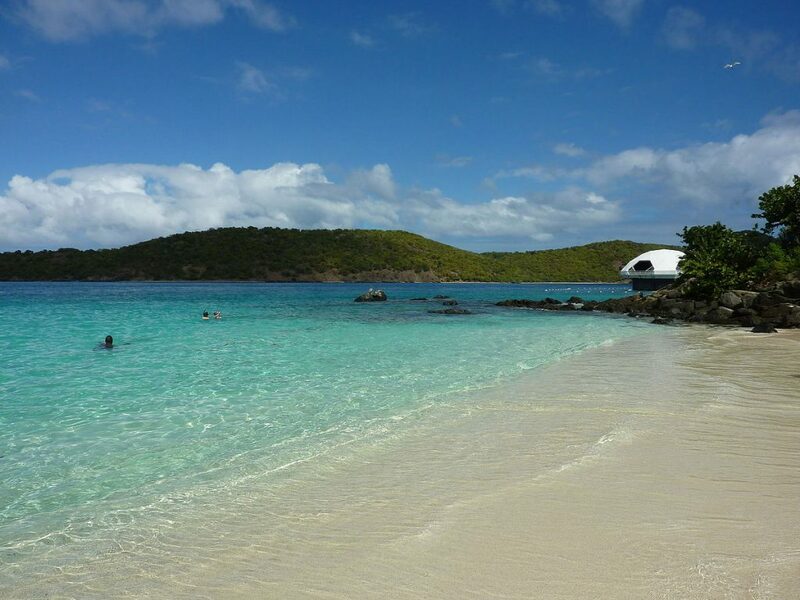 This USVI beach is also a great spot for scuba diving (there are over two hundred and fifty species of fish to see), to take a swim, or to lounge out on the sandy shore. 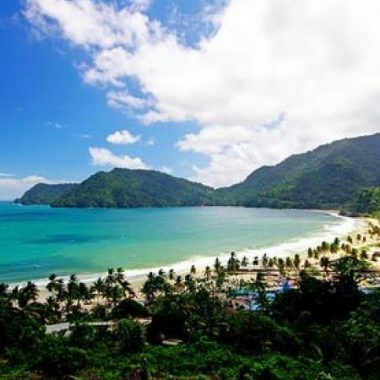 Keep in mind that you won’t see any amenities on this beach (except picnic tables and restrooms)- so, pack a snack and a bottle of water to keep you hydrated under the Caribbean sunshine. This beach is open from sunrise to sunset every day, and there is no fee to access it. The only thing you have to do is schedule the charter boat or book a tour with a company to explore Buck Island, as the only way to reach it is by boat. As far as places to stay are concerned, a fantastic family resort on St. Croix with enormous acreage, The Buccaneer, has endless activities for everyone, such as crab walks, treasure hunts, swimming pools, art lessons, tennis courts, paths to hike, and also a spa if you’re feeling like treating yourself. Complimentary breakfast is offered, and there are multiple restaurants to choose from as well. From St. Croix, you can take a boat out for the day to Buck Island, or you might choose to kick back and recuperate from all the fun you’ve been having at the resort. 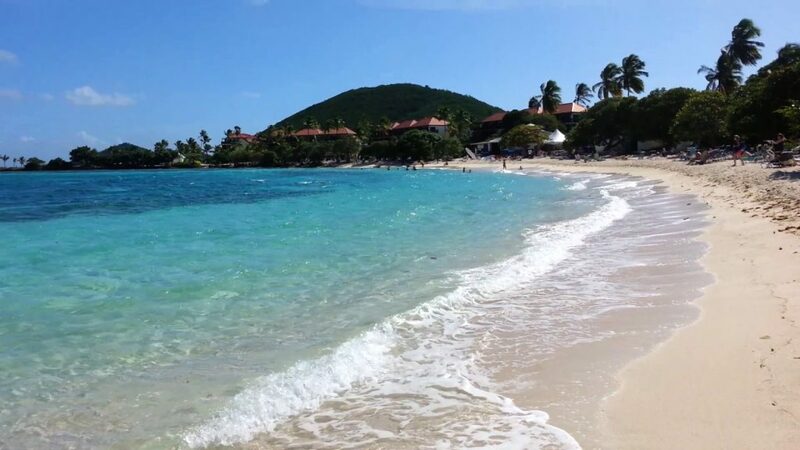 Known for being one of the most beautiful beaches on St. Thomas, and found on the Eastern side of the island – a short hop south east from Lindquist Beach – Sapphire Beach has been bestowed with clear, turquoise waters to bathe in, and year-round agreeable sea temperatures. If you’re interested in water sports and parasailing, Sapphire Beach Resort offers these activities on the shoreline, as well as sailing day trips and organized sport fishing. The resort is also located one mile away from the town of Red Hook, where you can purchase any last-minute items needed, or make a trip to the grocery store. Ferry service to St. John is also available here. If you’d like to dock your boat on the coastline, there are marina slips for sale. This USVI beach is considered to be an ideal spot for windsurfing, and also features three reefs where snorkeling can be enjoyed. Come every Sunday, there is a party with a choice island band that plays music that starts at two in the afternoon. Sapphire Beach Bar has yummy tropical chicken sandwiches, Mahi sandwiches, uniquely crafted cocktails, and cold beer. There is also live music that can be enjoyed in the afternoons, while you’re gazing out at the breathtaking view of the beach. During the Summertime, it can get crowded, so if you’re looking for seclusion, try arriving early in the morning or during the off-season. Found via a dirt road, and one of the best beaches in the island group, Smuggler’s Cove is located on the Eastern part of the island, and is quite remote, for those of you looking for the ultimate peace and quiet. With white sand, shade trees, and gentle waves, this beach is ideal for quality time with the family. Whether you choose to lounge out on the shore and breathe in the ocean air, go for a swim or a snorkel, or play in the sand, the surrounding beauty of this beach makes it all worth it. Do bring something to sip on and snacks, as there are not any amenities here. You might consider packing a cooler full of tasty drinks! On the western side of the beach, there are remnants of an antiquated dock, where you can see lots of small fish that gather around the remains and rocks. If you swim out a bit further, you’ll see starfish and perhaps some sea turtles. Expect to see the occasional local enjoying the waters here on the weekends, but not many other people. To find this somewhat hidden beach, begin by heading toward Cramer Park or Point Udall, then turn left on the dirt road that leads toward an area with trees. 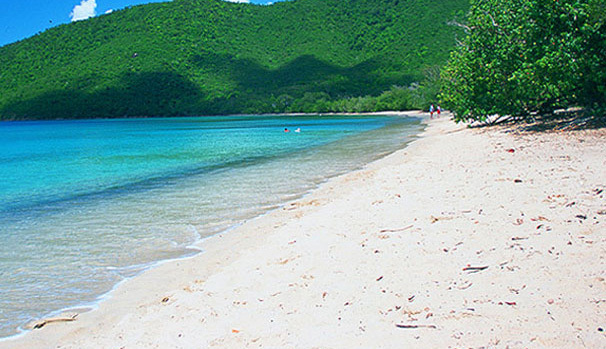 One of the longest beaches on St. John, Francis Bay Beach is a slice of Heaven. The beach faces West, and generally has calmer waters than other North Shore beaches, if you’re looking for some low-key beach activities, like bathing in the water or tossing around a beach ball. Snorkeling is great at either end of Francis Bay- sea creatures that you might be able to see while snorkeling includes parrotfish, blue tang, pompano, eels, stingrays, conchs, and barracudas. In the middle of the bay, you’re likely to see giant manta rays! Colorful coral abounds as well, that are sprinkled in between the aquatic terrain. Bird watching and paddle boarding are pleasurable activities that can be enjoyed in the clear waters of this beach. Take North Shore Road past Maho Bay Beach, and continue down the road until you see a ‘Y,” where you will keep to the left. Drive about a quarter mile further, and the access point will be on the right. Typically, you won’t have to park too far away from the beach for a decent parking spot. Bring a picnic blanket (or use your sarong!) to enjoy a homemade lunch on, and pack some cold beverages, as there are no restaurants or amenities here. However, you will find restrooms. One of the best beaches in the area, Rainbow Beach is situated at the Western side of St. Croix, and features blue-green hued water with palm trees that whisper secrets in your ears. For some fun under the sun, you can participate in beach activities like volleyball, or dance to the live music. There are also jet skis, lounge chairs, snorkel and kayaking gear, and floats to rent if you’re interested. You’ll find a restaurant and a bar, as well as ample parking on Rainbow Beach. There can be rocky areas under the water, so you might feel inspired to bring some water shoes. Or simply brave the rocky patches and go barefoot- it’s up to you! There aren’t many shade areas, so consider bringing an umbrella or a sunhat. There are also beach umbrellas you can rent, too. 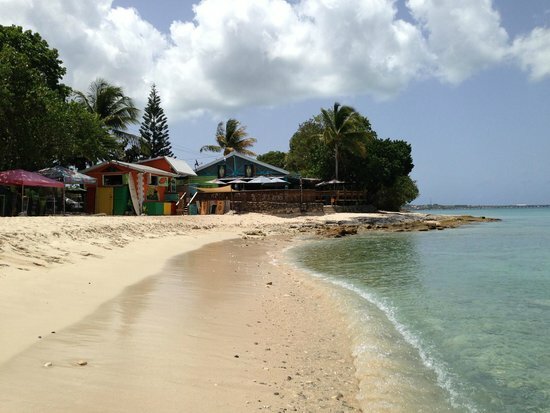 This stunning beach is located on Route sixty-three and is North of Frederiksted. One of the top beaches on the archipelago, Coki Point’s shimmering, clear waters, and pristine sand compose the grandeur of this cove. Get ready for a dose of Vitamin D from the abundant sun rays- there’s not a whole lot of shade here, but there are umbrellas available for rent. This beach can become busy at times, with cruise ships pulling in and passengers disembarking, and you’ll also see locals enjoying parties and beach activities. You won’t be disappointed in the food selection if you decide to visit Coki Point- as the options range from beachfront eateries to food trucks, where you can choose between burgers or sandwiches, and things of the like. If you get thirsty while you’re sprawled out on your beach towel, there are beachside waiters that serve drinks so you don’t have to move a muscle! There’s also a booth where you can rent jet skis, and a dive shop. In addition, there are neighboring vendors that rent snorkel gear and fun noodles that you can float on. If you’ve been wanting a new island-vibe hairstyle, you might choose to get your hair braided from one of the braiders along the shoreline. This picture perfect beach is located next to Coral World Marine Park, where you can swim with sea lions, or have an encounter with a shark. You can also spend time with some iguanas or exotic birds like the Australian Rainbow Lorikeet that have been born and bred in captivity here. In addition to all of the creatures that you’ll experience, there is an extensive nature trail, where you can see red-footed tortoises, and vital trees native to the Virgin Islands. How is the climate in the Virgin Islands? This is the land of eternal Summertime weather, or at least a locale where you’ll find an overwhelming majority of days with good weather. Expect consistent and pleasant weather year-round. June, July, and August are generally the hottest months. There is no official rainy season, but from November to May you can expect patches of rain. Hurricanes are an uncommon occurrence, but when they do make their appearance, it mainly happens in August and September. In Winter, the water may be cool and a bit choppy, so snorkeling may not be an ideal activity to do during this time, but plan to do it all day long in the calm waters of Summertime. Will I need a passport to be granted access? If you are a citizen of the United States, you do not need a passport to travel here, since it’s a territory of the U.S. It’s kind of like traveling from state to state within the country. You should, however, travel with some proof of citizenship (like driver’s license or birth certificate), and prepare to be asked some questions about your citizenship. If you are not a U.S. citizen and are arriving from an international flight, you’ll want to have applied for a U.S. visa prior to booking your flight and have your passport on you. Also, consider booking an onward flight in advance to verify to the airport officials that you will not indeed be staying in the country longer than the time you are granted. Will I need an electrical converter? The electric voltage on the islands is the same as that in Canada and the mainland U.S., which is one hundred and ten to one hundred and twenty volts. So, if you’re a U.S. or Canadian resident- you are already set and won’t need to be concerned about this. Do I need any special vaccinations to visit this territory? No, there are no vaccinations required to enter the region, unless you’re traveling from a part of the world where cholera or yellow fever is endemic. Note that anyone that does not appear to be in good health is subject to a medical exam. What is the unit of currency used? The U.S. Dollar is the currency used in this U.S. territory. If you do need to exchange currency while on the island, the only places where you can do this are at banks, and the rates and fees can sometimes be pricey. So, think about exchanging your money prior to arrival if possible. Many places on the islands do accept credit cards, however, you will come across some businesses that only accept cash. ATM’s are not hard to come by, though. If you’re planning on relying on lots of taxis- keep in mind that most only accept cash. What is the legislation like in regards to smoking? In public buildings and within restaurants, smoking is prohibited. And, as long as you’re at least twenty feet away from the bar entrance, you can smoke outside of it. Only on the British Virgin Islands (a group of islands and islets neighboring to the North, that are owned by the British) is smoking completely banned in public places and within fifty feet of any public space. How is the safety of the water quality? Many visitors that travel here are able to drink the tap water with no complaint. It’s best to buy bottled water, though, if you have a sensitive stomach or any concerns. There are a number of hotels that even have their own desalinization plants to make the water very potable and tasty! What should I do to prevent overexposure to the sun? Sunglasses and a sunhat would be handy accessories to pack in your suitcase, as the sun can be quite intense. Don’t go too crazy having fun under the sun when you first arrive, as you likely won’t realize how quickly your skin is baking! Slowly ease your way into it. The moment you feel like you might have had a bit too much sun, step out of it and wait until the next day to re-expose yourself to it! What is the difference between the U.S. and British Virgin Islands? 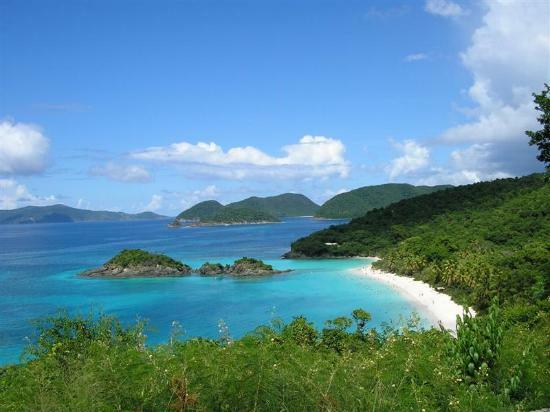 The U.S. Virgin Islands is a territory of the United States, while the British Virgin Islands is one of Great Britain. The British Virgin Islands are more relaxed, and a bit more expensive. There is a different ‘feel’ on the islands, but overall they feature similar clear waters, undisturbed sand, and nearly ceaseless sunshine. What is there to do other than relax on the shoreline? There are a myriad of activities to do! You might choose to go on a nature hike, or spend the day on land browsing around shops. Snorkeling or scuba diving around Buck Island Reef National Monument, one of the most ecologically diverse marine gardens in the world, would be a memorable experience. Another option is checking out a rum distillery or simply going out to enjoy a glass of iced tea. How should I plan on traveling around if I don’t want to spend money on a taxi? You may want to consider renting a car if there are a lot of places you’d like to go, as opposed to paying for a taxi- just remember that you’ll be driving on the opposite side of the road. You can also opt to take the local buses, or walk if you don’t plan on going far. Think like a minimalist. Pack as little as possible- remember that you can buy everything you need when you arrive! You could get away with just packing a carry-on and bringing an extra empty suitcase. It’s up to you! All you really need is some beach attire like some shorts, a tank top, and some flip-flops for starters.